Heritage Carriage Rides combines owner Peggy Wilson and her husband, Jerry May's two passions – Cinderella style and horses. Throughout her life, Peggy owned several wedding related stores, including the appropriately named "Cinderella's Closet", a consignment shop specializing in wedding dresses. Peggy took a leap of faith after opening her first horse-drawn carriage company in her native Cartersville, GA – she opened Heritage Carriage Rides, the first company to offer horse drawn carriage rides in Pigeon Forge! Offering Walden's Landing Carriage Rides since March of 2010, let Heritage Carriage Rides bring a royal touch to your special day! A true romantic at heart Peggy's desire to create "Cinderella Memories" for weddings, anniversaries, birthdays, etc shows in her well-thought out packages for couples. These packages include roses, pictures, and all the elements for a fairytale carriage ride that allows you to the be the prince charming for your beautiful princess! The most popular of Peggy's packages is the "Romance Package"
After booking your appointment for the special "Romance Package" with Heritage Carriage Rides, your driver will arrive promptly at your scheduled time. As your carriage approaches, donned in twinkling lights, prepare yourself for the look of pure joy on that special someone's face when she finds 4 dozen of her favorite color of sweetheart roses sitting in the seat for her. After a 15-minute carriage ride, you both will step out of your carriage to Calhoun's Restaurant where your reservations for dinner await. After filling your bellies with delicious Southern-style food, call your driver to pick you up for another 15-minute drive back to Walden's Landing. During the whole trip, Peggy will be capture all the wonderful moments with her camera! A CD with all the memories of your proposal, wedding, or anniversary comes complete with the Pigeon Forge carriage ride package. The "Romance Package" isn't the only option available for Pigeon Forge carriage rides at Heritage Carriage Rides. Couples can either rent a carriage for an hour on the Walden's Landing property or have the carriage transported to their venue for fairytale weddings! Additionally, Peggy offers a package complete with a long stem rose, 15-minute carriage ride, and complimentary pictures. Whether you chose the deluxe "Romance Package" or a smaller package, Peggy will ensure that your special day makes your special someone feel like the true princess she is with fabulous horse drawn carriage rides in Pigeon Forge, TN at Heritage Carriage Rides! 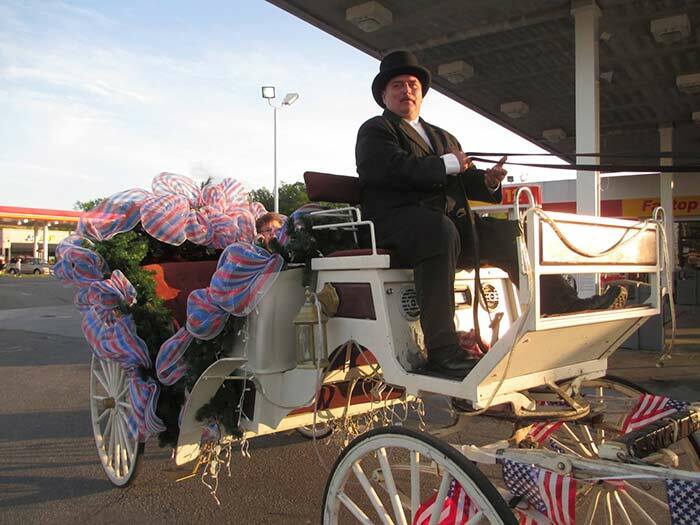 Pricing for Heritage Carriage Rides are available by calling 865-365-5130. Since part of the appeal of these romantic carriages are their delightful twinkling lights, "Romance Package" appointments can only be booked after sunset, so that your sweetheart can enjoy every bit of the magic! In addition to the Walden's Landing carriage rides, Peggy and Jerry opened Gold Rush Stables, the only horseback riding stables in Pigeon Forge. Located right across from Dollywood Splash Country, Gold Rush offers several horseback riding experiences for the whole family, ranging from beginners to advanced trails. Cabins USA's list of Smoky Mountain riding stables for other options for great horseback riding around Pigeon Forge Tennessee.